"Exceptional knowledge and truly cares for his patients." "This doctor is a highly trained doctor from the best chiropractic school in the world." "Smart, caring, and experienced doctor. I would recommend any of my family to Dr. Nick"
"Dr. Nick is phenomenal!! Don't miss an opportunity to see him!" Aligned Health Center serves patients in the Westlake, Ohio and Beachwood, Ohio areas. They are the first Chiropractic BioPhysics ® clinics in Northern Ohio. The team at Aligned Health Center helps patients with back pain, neck pain, migraines, ADHD, digestive issues, sleep disturbance, whiplash, scoliosis, and much more. The mission at Aligned Health Center is to help people in the Westlake and Beachwood areas achieve the best possible health and overall wellness. 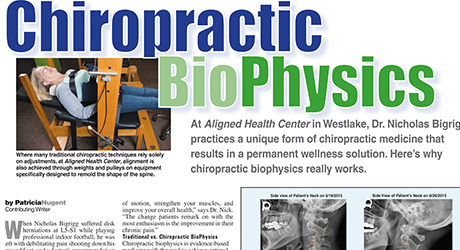 As chiropractic biophysics providers, Aligned Health Center addresses the structure of the spine as a whole piece. The spine should have a certain shape to it. When it’s in that proper shape, it's easily able to support the body. Traditional chiropractic care focuses on how 2 bones relate to each other while Chiropractic BioPhysics ® can literally reshape the spine to its ideal overall shape. Call anytime to make an appointment to learn more about how Aligned Health Center can help. Not your traditional chiropractor. We're so much more. Call to learn more about CPB! Dr. Nicholas P. Bigrigg, D.C.
Dr. Nick was born and raised in northeast Ohio along the shores of Lake Erie. He graduated from Amherst Steele in 2001 with an honors diploma. While attending Steele, Dr. Nick excelled in football and track and field. He led the Comets to two conference championships in football and as a senior placed second at the Ohio High School State Track and Field meet in the pole vault. After high school, Dr. Nick competed on the varsity football team at Kent State University, Kent, Ohio, from 2001-2005 while completing his bachelor's degree. Dr. Nick completed his education at Palmer College of Chiropractic where he earned his Doctorate of Chiropractic Degree. While at Palmer College he served as the vice president of the rugby team, which qualified for the National Final Four twice during his three years. Post graduation, he has undergone extensive training in structural (postural) analysis at the CBP training facility, Ideal Spine Health Center in Boise, Idaho. He has also pursued additional training in advanced soft tissue (muscular) treatments and pediatrics. Following his undergraduate training at Kent State University, Dr. Nick competed in various indoor professional football leagues. It was during this time that he suffered an incapacitating injury to his low back. He was told that the injury would require surgery in order to sustain a reasonable quality of life and that he would no longer be able to work as an athlete. Dr. Nick sought a second opinion and met a chiropractor who addressed the structure of his low back. Through this treatment not only did he avoid surgery and maintain a high quality of life but he returned to the field for one more season. Throughout his care, Dr. Nick began to see other positive changes to his overall health leading him to explore the full benefits of chiropractic care. It was this experience and the desire to share it with others that lead Dr. Nick to pursue a career in chiropractic. Dr. Nick currently resides in Bay Village, Ohio with his wife, Elizabeth, and their two children Logan and Lauren. He enjoys spending time with his family, being outdoors, running, weight training, football, basketball, baseball, rugby, and golf. Maria was born and raised in the west side suburbs of Cleveland in the small town of Amherst, Ohio. She was a competition cheerleader growing up and graduated from Amherst Steele High School. She attended the University of Toledo with a major in Television Broadcasting but quickly found a love for technology and marketing. That, combined with her natural interpersonal communication skills, led her to start working for an Internet company based out of San Diego, California. 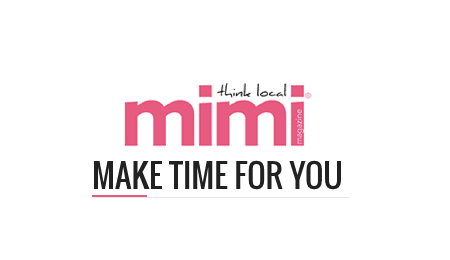 After about 2 years, Maria was offered a management position in the San Diego office and in 2007, moved to Fallbrook, California. Over her 8 1/2 year career with the company, she managed offices both here in the states as well as overseas and was given the opportunity to work in every department ranging from Customer Service to Human Resources to Sales and Marketing. In the summer of 2013, Maria and her three children moved back to Ohio to be closer to her family. She worked in direct sales for about a year before she was hired as the Director of Business Development at Aligned Health Center. Maria now lives in her hometown of Amherst with her three children Nevaeh, Alexander, and Calvin. She enjoys outdoor activities with her kids, cooking, football, and spends several days a week in the gym weightlifting. The human body is designed to be self-regulating and self-healing. The part of the body which is responsible for the self-regulating and self-healing properties of the body is the nervous system. The spinal column is designed to protect the vital connection between the nervous system and the body. Therefore, an optimal functioning spine and nervous system is imperative for one to achieve and maintain a healthy state. Today the research says it all. The following list of research is by no means complete. We will continue to add quality research to our archive so be sure to check back regularly. If there is a health concern which you do not see listed below but would like to know if chiropractic can help you please contact our office and we will be more than happy to discuss your particular situation. "I am confident that through Dr. Nick's care my spine will be re-molded back to it's correct posture and I will be free of pain." "At first I was unsure. But now I am pain free. Thank you Dr Nick are truly a gift from God." "Dr. Nick Bigrigg is extremely knowledgable and will help you with your healthcare needs, just as he did with me and my family."